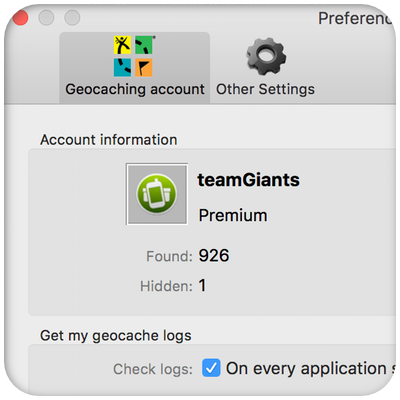 iCaching is the all-in-one Geocache manager for the Mac. If you get a ‘can’t be opened warning’, you can open the application by right click (or cmd-click), and choose the ‘Open’ menu item. In the following warning dialog click ‘Open’ and it will run normally from now on. 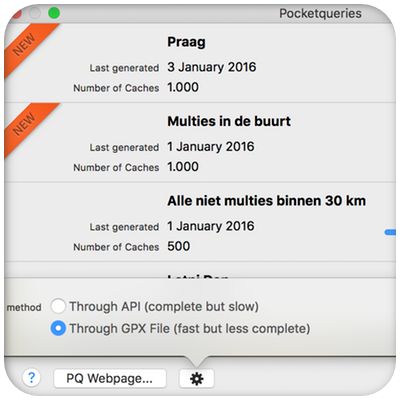 iCaching makes it very easy to import geocaches from different sources; GPX- and LOC-files, the API or Pocketquery dialog. From version 4.0 iCaching supports the Geocaching.com API. 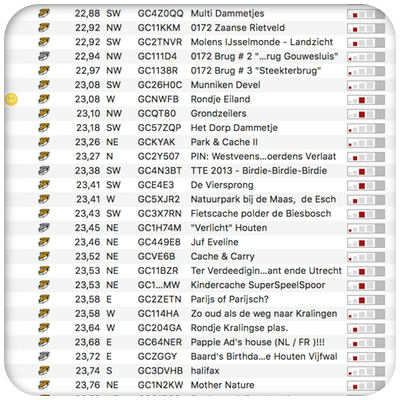 Through the API you have direct access to Geocaches, Pocketqueries and much more. After organizing your geocaches you want to take them with you for the hunt. 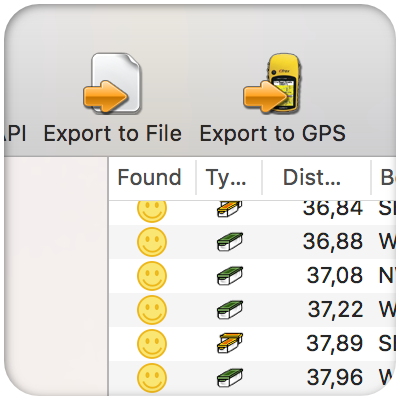 iCaching supports a lot of GPS devices and fileformats for exporting your geocaches. 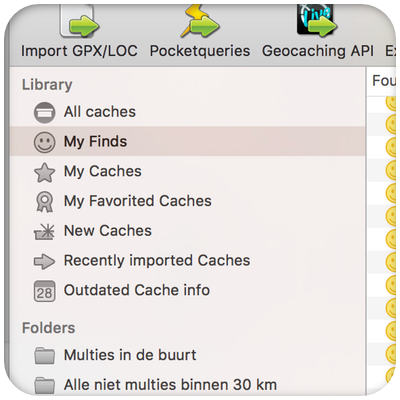 The Library with predefined folders like: All caches, My founds, My Caches etc. 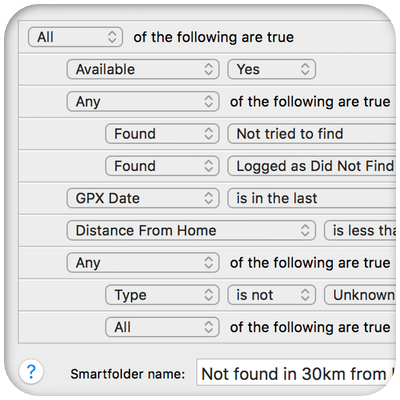 Smart Folders are folders based on search criteria. The cache-list is highly customizable. You can select which columns you want to see by right-clicking the column-headers, resize the columns and/or rearrange columns. The content of the table can be sorted by every column, just click the column-header. The counter below the list indicates the number of caches in the list. And unavailable caches are grayed out. 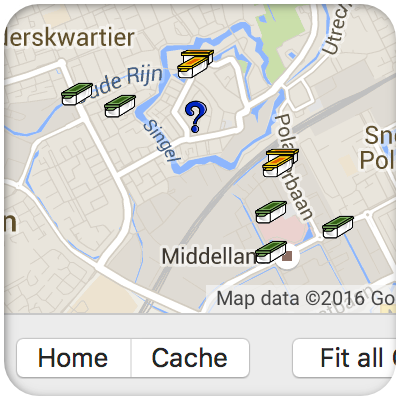 Show your caches and home location on the interactive map. Clicking on the Map brings you to a the cache. 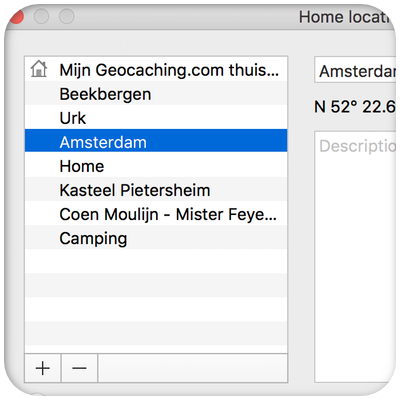 The Info-tab gives a clear overview off all the properties of a geocache: type, size, terrain, difficulty and so on. 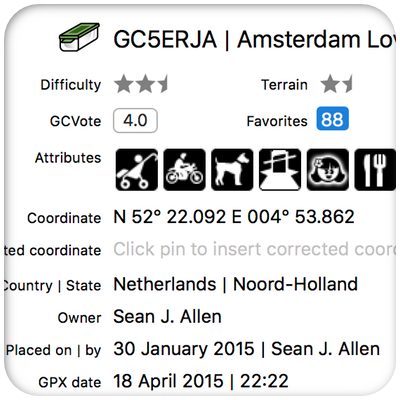 You can also insert solved coordinates, (un)favorite caches and add a note. iCaching can contain multiple home-locations as center point for filtering and sorting on distance and bearing. iCaching will automatically get your homelocation from Geocaching.com. The quick searchfield on the toolbar is a fast way to filter the visible caches. For more complex filtering based on one or multiple criteria, and even compound filters to combine criteria in ‘all’, ‘one off’ or ‘none’ conditions. You can save a filter as a Smart Folder for convenient reuse of your filters.